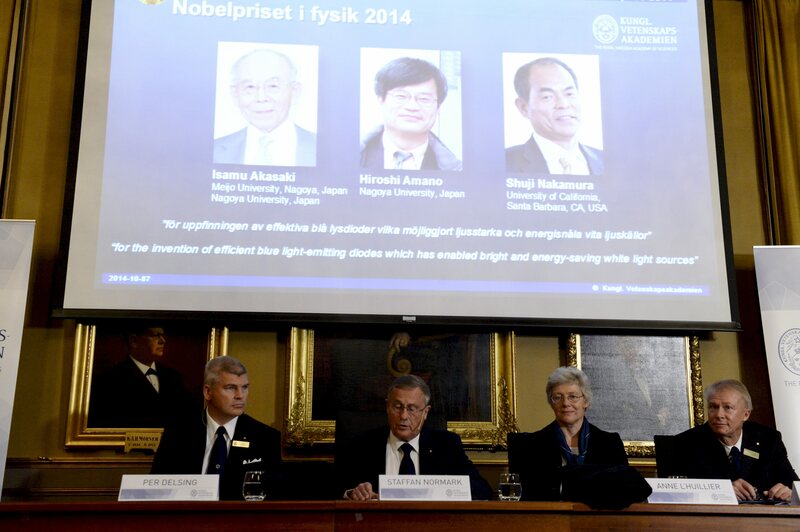 STOCKHOLM -- Two Japanese scientists and a Japanese-born American won the Nobel Prize in physics on Tuesday for inventing blue light-emitting diodes, a breakthrough that has spurred the development of LED technology to light up homes, computer screens and smartphones worldwide. The Royal Swedish Academy of Sciences says the invention is just 20 years old, "but it has already contributed to create white light in an entirely new manner to the benefit of us all." Isamu Akasaki, Hiroshi Amano and naturalized U.S. citizen Shuji Nakamura revolutionized lighting technology when they came up with a long-elusive component of the white LED lights that in countless applications today have replaced less efficient incandescent and fluorescent lights. "They succeeded where everyone else had failed," the Nobel committee said. "Incandescent light bulbs lit the 20th century; the 21st century will be lit by LED lamps." Red and green light-emitting diodes have been around since the mid-20th century and have been used in applications such as watches and calculators. But scientists had struggled for decades to produce the shorter-wavelength blue LED needed in combination with the others to produce white light when the three laureates made their breakthroughs in the early 1990s. Their work enabled LED lights - more efficient and long-lasting than previous light sources - to be used in a range of applications, including street lights, televisions and computers. It can even disinfect surfaces and light up green houses. "It is very satisfying to see that my dream of LED lighting has become a reality," Nakamura, 60, said in a statement released by the University of California, Santa Barbara, where he is a professor. "I hope that energy-efficient LED light bulbs will help reduce energy use and lower the cost of lighting worldwide," he said. Akasaki, an 85-year-old professor at Meijo University and Nagoya University, said in a nationally-televised news conference in Japan that he had often been told that his research wouldn't bear fruit. "But I never felt that way," he said. "I was just doing what I wanted to do." Akasaki and Amano, 54, made their inventions while working at Nagoya University. Nakamura was working separately at a relatively small Japanese company, Nichia Chemicals. He chose that company because he wanted to raise his family in the small town in which it was based, but there was another advantage. In a 2002 interview conducted by The Franklin Institute, Nakamura explained "if the company is small, basically, no boss at all. So I could do anything what I want to do." The three engineers built their own equipment and carried out thousands of experiments - many of which failed - before they made their breakthroughs. Nakamura told The Franklin Institute "I experienced explosions many times" when trying to produce the crystal at the heart of the invention. The Nobel committee said LEDs contribute to saving the Earth's resources because about one-fourth of world electricity consumption is used for lighting purposes. They tend to last 10 times longer than fluorescent lamps and 100 times longer than incandescent light bulbs. "The blue LED is a fundamental invention that is rapidly changing the way we bring light to every corner of the home, the street and the workplace - a practical invention that comes from a fundamental understanding of physics in the solid state," said H. Frederick Dylla, the executive director and CEO of the American Institute of Physics. Phillip Schewe, a physicist at the Joint Quantum Institute at the University of Maryland, said the prize shows that physics research can provide a practical benefit, rather than just probing the mysteries of the universe. LED technology holds particular promise in lighting up parts of the developing world with poor electricity grids, Nobel committee member Olga Botner said. Ultraviolet LEDs can also be used to sterilize water, she said. "It is not just for lighting Christmas lights on the streets of Stockholm in December but really something that benefits mankind, particularly the Third World," she said. Nadarajah Narendran, director of research at the Lighting Research Center at the Rensselaer Polytechnic Institute in Troy, New York, estimated that about 10 percent of illumination in U.S. homes, offices, streets and industries comes from LED lights. Within five years, he said, that fraction will probably exceed 30 percent as prices come down. On Monday, U.S.-British scientist John O'Keefe split the Nobel Prize in medicine with Norwegian couple May-Britt Moser and Edvard Moser for breakthroughs in brain cell research that could pave the way for a better understanding of diseases like Alzheimer's. The Nobel award in chemistry will be announced Wednesday, followed by the literature award on Thursday, the Nobel Peace Prize on Friday and the economics prize on Monday. Worth 8 million kronor ($1.1 million) each, the Nobel Prizes are always handed out on Dec. 10, the anniversary of prize founder Alfred Nobel's death in 1896. Besides the prize money, each laureate receives a diploma and a gold medal. Nobel, a wealthy Swedish industrialist who invented dynamite, provided few directions for how to select winners, except that the prize committees should reward those who "have conferred the greatest benefit to mankind." Last year's physics award went to British scientist Peter Higgs and Belgian colleague Francois Englert for helping to explain how matter formed after the Big Bang.